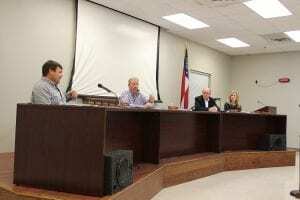 Blue Ridge, Ga. – The Fannin County Board of Commissioners (BOC) began the process of opening up the way for competition when it comes to waste removal in the county. Recent commission meetings showed much discussion about the current contract with Advanced Disposal. The contract set to expire on Sept. 1 of this year, requires the BOC give at least 180 day notice if there is intent to amend or cease further business with the company. Board of Commissioners speak with attorney Lynn Doss about opening the door to competition. All board members did recognize the asset Advanced Disposal has become to Fannin County through their community partnerships and participation. “The intent is not to get rid of ADS. We still need them as an operator in our county,” Chairman Stan Helton spoke of the intentions behind the contract discussions. An individual has come forward and spoken with commissioners about the possibility to offering their services to the county. Helton had a meeting with the individual that he referred to as being “positive”. “This is a gentleman that has an interest in serving the community and he’s got equipment and a transfer station that would be available,” Helton said explaining the meeting and pointed out that the services the individual could provide would be on a much smaller scale than Advanced Disposal. Post 2 Commissioner Glenn Patterson shared his thoughts that “competition’s always good”. Previously Fannin County was under consent and by court order could only allow for one solid waste transfer station to operate. This order has since expired. Fannin County Attorney Lynn Doss told the BOC that she would review the consent order and work towards allowing for the county to have more than one solid waste transfer station and recommended that the BOC develop a pricing template for waste removal before seeking bids. Johnson added to this that the county needs a set of requirements, above the already mandated state requirements, to ensure that companies operating in the county are permitted by the state and capable of delivering the results that are agreed upon. Helton reiterated that he is not in favor of eliminating Advanced Disposal’s services as the county’s primary supplier and added that he didn’t feel that anyone at this time is in a position to take the place of Advanced Disposal. “We felt if there was some way to open up a little bit of competition, perhaps that would be the favorable result for the county,” Helton explained that perhaps in years to come that a door would open to receive numerous bids. No official vote was needed in the matter and with all three commissioners in agreement about saving the residents of Fannin County money, they gave the go ahead to Doss to notify Advanced Disposal of their intent to negotiate the upcoming contract. Blue Ridge, Ga. – Tony Sidebotham, Advanced Disposal Operations Manager for the North Georgia Area, met with the Board of Commissioners (BOC) recently to discuss the terms of the upcoming waste disposal contract renewal. The current contract was signed and agreed upon 2016, and is up for renewal on Sept. 1 of this year. According to the current contract the county must give Advanced Disposal 180 day notice if there are requests for changes or negotiation discussions that need to take place. Currently Fannin County pays $54.16 per ton for waste disposal, and in the current contract this price is subject to increase by three percent annually. Advanced Disposal has approximately 150 to 170 tons of waste that move through their facilities daily. Sidebotham explained that the three percent increase covers his cost of operations. He told commissioners that not only does pricing go up for the services Advanced Disposal utilizes but he also has to consider his employees and their raise requests and benefits. Fannin County Chairman Stan Helton questioned how Fannin County’s pricing compares to those of surrounding counties. “It’s hard to compare contract to contract,” Sidebotham replied and explained that each county has different needs and different circumstances. One of the circumstances affecting the pricing in Fannin County is that with the exception of the Aska Road facility, which is county owned property, Advanced Disposal owns its own properties in the county. Sidebotham replied that anything is up for discussion, and acknowledged the Union County does have different pricing because the county owns its own facilities. “It’s going to hard because they own their facilities and in other counties they (the counties) own their facilities, so in the years past these contracts, being as they own the only transfer station in the county, our rates are automatically going to be higher,” Johnson expressed his opinion on what drives the pricing higher for our area. Johnson pointed out that Fannin County only allows for one transfer company to be present. He feels that this also plays a role in being unable to obtaining competing pricing. Glass recycling was also discussed as it has been a concern for numerous residents since the option of recycling glass was discontinued. A glass recycling facility in Pa. shows the large property needed to accommodate this type of recycling. Advanced Disposal and their employees have taken proactive steps to become a positive impact on the community during the current contract. Recently the business agreed to extend holiday hours in an effort to help Fannin County with their unique circumstances that causes an influx of visitors during these time. Previously the waste disposal facilities in Fannin County were closed six days a year in observance of different holidays. Advanced Disposal agreed to open half days for three of these major holidays (Fourth of July, Labor Day, and Memorial Day) and only remain closed Thanksgiving, Christmas, and New Year day. Advanced Disposal has also donated dumpsters and containers for community clean up events, and have recently agreed to pick up certain colored garbage bags from sides of roadways where litter collection has taken place. The Fannin County Fire Department also benefits from the collection of aluminum cans at the Advanced Disposal sites. 100 percent of proceeds from these collections go to fund the fire department’s educational outreach programs. A full time litter personnel was recently hired and will soon be seen in Fannin County two days a week to help combat the ongoing litter issue. Sidebotham expressed that he would continue efforts at the facilities to hold trash haulers responsible for securing their loads. He explained that aside from having clear signage posted pertaining to the law, with first time offenders he often will have them pull to the side and secure their load before being allowed to tip. “I have found that sometimes the inconvenience of having to do that, you know taking an extra 10 – 15 minutes, the next time they come through they would know that it has to be secured,” Sidebotham said of the effect the effort has on those pulled aside. A new scale house will be seen at the Hwy. 60 waste disposal facility. The scalehouse will be placed to allow direct and immediate contact between Advanced Disposal personnel and drivers. This move will help to combat the issue of unsecured loads as well, as it can be addressed immediately upon the vehicle entering the scales. While negotiations are expected to take place concerning the current waste disposal contract, all three commissioners acknowledged the work being done by Advanced Disposal in Fannin County and showed appreciation for the company’s willingness to get involved. « Previous Article New bridge to be built on the busiest stretch of Aska Road- Are families now at risk?